WHAT IS THE YU-GI-OH! TRADING CARD GAME? With the Yu-Gi-Oh! TRADING CARD GAME you can take part in the exciting card game action seen in the family of Yu-Gi-Oh! TV and comic mega-hits, including Yu-Gi-Oh! 5D's. In this game, two players Duel each other using a variety of Monster, Spell, and Trap Cards to defeat their opponent's monsters and be the first to drop the other's Life Points to 0. There are thousands cards to choose from, so collecting cards will let you customize your Deck and increase your chances of winning! This is the official Yu-Gi-Oh! TRADING CARD GAME rulebook. It's important to learn how to play correctly, so you should read this rulebook before playing if you're new to the game. Understanding the rules will help you make the best use of your cards, so keep the rulebook handy during your first few games. 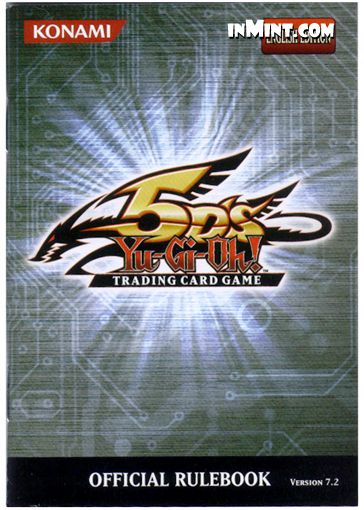 You can also visit www.yugioh-card.com for answers to frequently asked questions and an interactive game demonstration. Originally included with Yu-Gi-Oh! Structure Decks.